where you wish you would never have to leave." Alaska Basin is one of my Top Twenty favorite places to hike -- and I've run or hiked in a lot of beautiful places around the USA. This entry is three pages long. 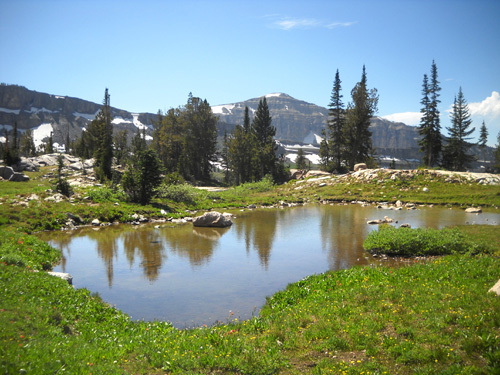 It describes the area I hiked today in Alaska Basin and Teton Canyon and is accompanied by photos to illustrate the text. I have uploaded two photo albums with these and additional pictures from the canyon and basin on our Picasa site. One album has photos of the canyon trail and the other, the basin trails. Those pictures are larger so you can see them better. I took a gazillion photos and I want to share a bunch of them in a virtual tour because so few people (relatively speaking) will ever see this place close up. The only way to get there is on foot. Bikes aren't allowed in the wilderness. Horses can go up through the canyon but not into the basin. I suppose you could fly over Alaska Basin in an airplane but it's not the same as hiking or running through it and experiencing it close up. So sit back, relax, and enjoy the tour! 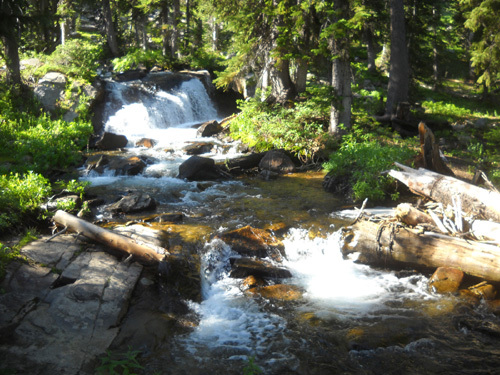 If you enjoy hiking in the mountains maybe these pictures will entice you to visit the "back side" of the Tetons. 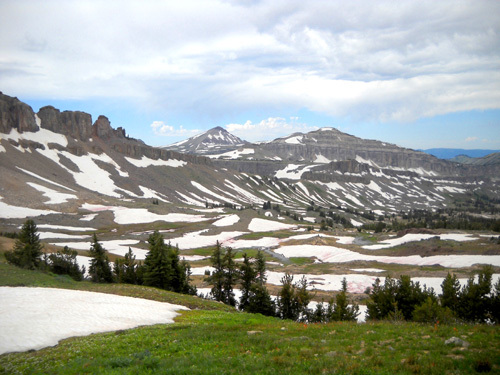 Alaska Basin is located in the Jedediah Smith Wilderness Area of the Caribou-Targhee National Forest just outside the western boundary of Grand Teton National Park in Wyoming. It is very close to the Idaho border. 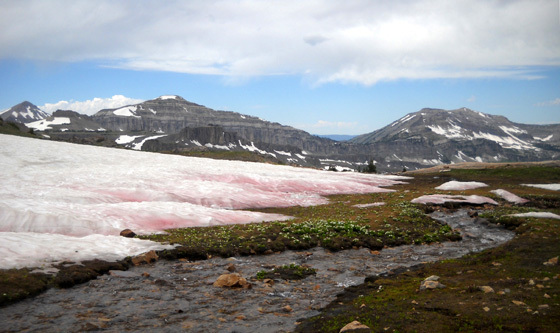 This high alpine basin got its name because it resembles areas of tundra in Alaska. We haven't been to Alaska yet (that's our grand adventure for 2012) so I can't vouch for the comparison. and lots of wildlife including moose, elk, and bears. 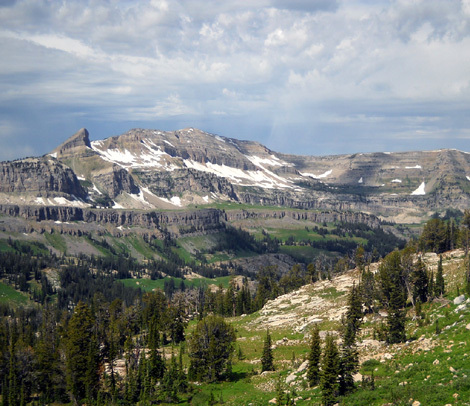 Alaska Basin and Teton Canyon are surrounded by a rim of high peaks -- Battleship Mountain (10,679 feet) to the north, South Teton Peak (12,514 feet) to the northeast, Veiled Peak (11,330 feet) and Buck Mountain (11,938 feet) to the east, an unnamed 11,094-foot peak and Mount Meek (10,681 feet) to the south, and an interesting peak called The Wedge (9,830 feet) to the west. of the mid-levels from about 10,400 feet elevation. 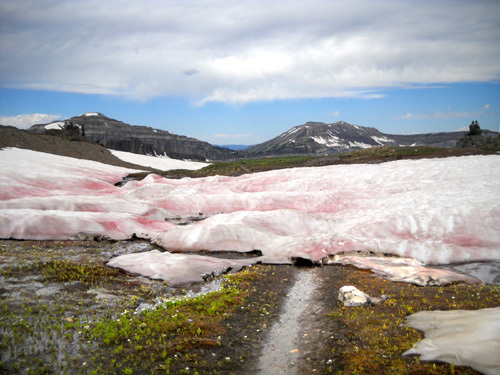 Alaska Basin and its lower canyon were formed by the action of glaciers. 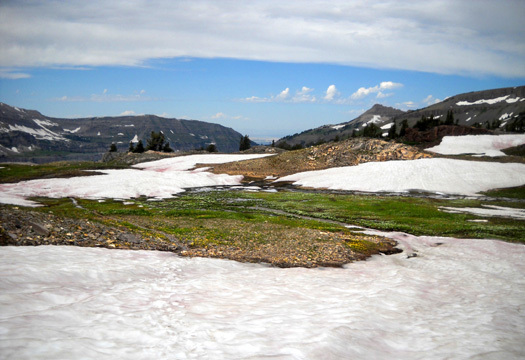 Although several glaciers remain on the eastern side of the Teton Range in the national park there are no permanent ice fields on the western side where Alaska Basin is located. 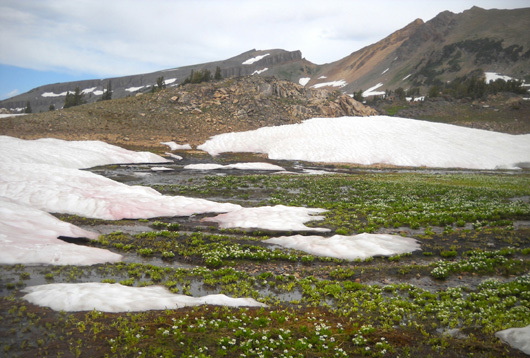 Last winter's snow pack was so deep, however, that quite a bit of snow remains in the western basins of this mountain range even now at the end of August. I seriously doubt all of the snow in Alaska Basin will melt before more snow starts falling again soon. 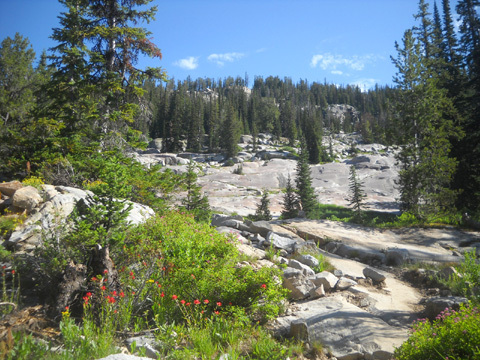 There are several well-established trails in and near Alaska Basin. 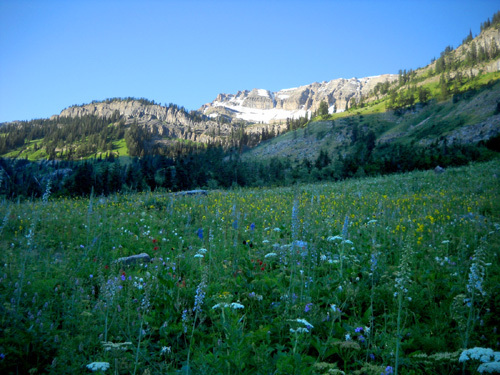 You can reach it from either the east or west side of the Teton Range, as well as the ridgeline from the north or south. On my detailed National Geographic Trails Illustrated map of the Tetons the same thing is called the Alaska Basin Trail ( #027). 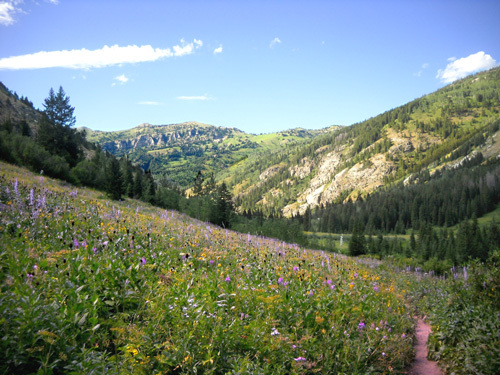 I usually just call it the Teton Canyon Trail because it leads to more than just Alaska Basin. Not all the trails are shown on that diagram. I marked today's 21�-mile route in yellow on the diagram above. 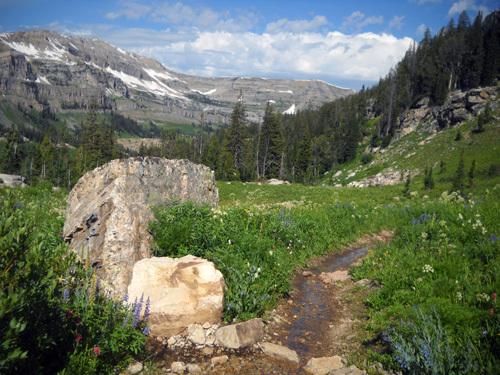 I've hiked up to Alaska Basin on the Teton Canyon Trail at least a dozen times since we started camping at Reunion Flat in 2007. 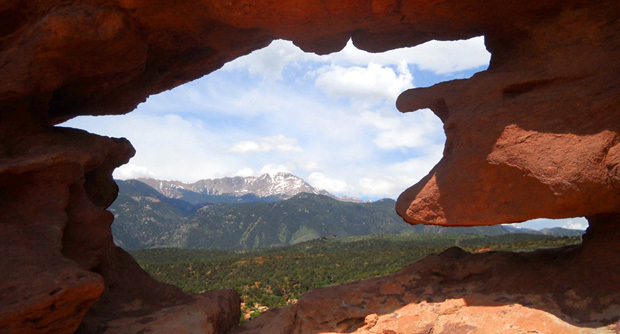 All of those hikes have been out-and-back, never to the other side of the mountain range. Some of those times I turned around once I got into the lower basin or the lakes and went back down for a total of about 16-18 miles. 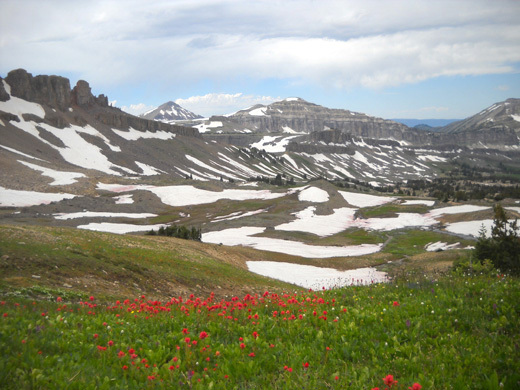 Other times I've gone north from the lower basin on the Teton Crest Trail to Sunset Lake and Hurricane Pass for a total of 20-22 miles. 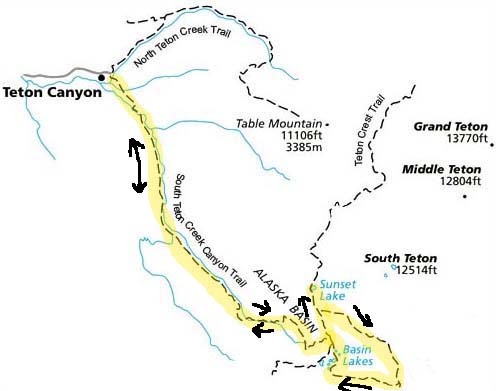 Two or three times I've gone past the basin lakes up to the higher reaches of Alaska Basin on the western flank of Buck Mountain and back, hiking just the lower half of the loop shown in the diagram above. That's 20-21 miles total. 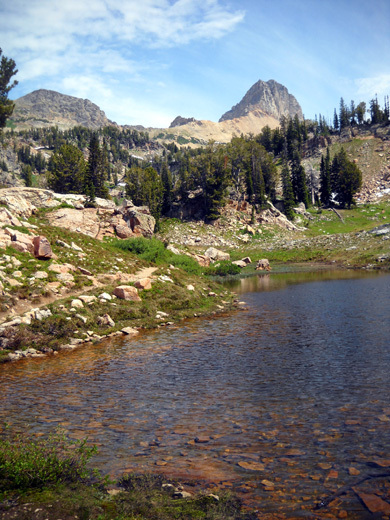 What I haven't done before is to continue another half mile to Buck Mountain Pass at the edge of the national park or to complete the basin loop on the Alaska Basin Shelf Trail (#026) toward Sunset Lake and back on the Teton Crest Trail (#006) to the Canyon Trail. I decided to remedy that today. I did a complete loop in the basin but did not go up to Buck Mountain Pass because I didn't have time. I'll do that on another hike. 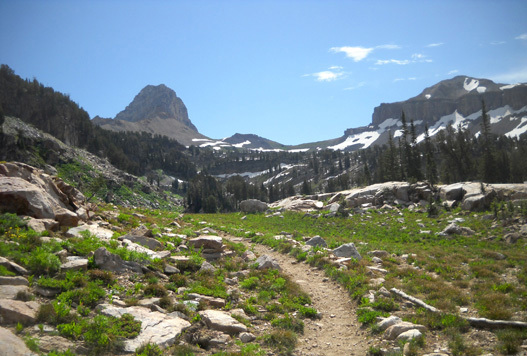 There are a couple other trails I haven't hiked previously on this side of the Tetons that I want to explore this year, too. Stay tuned for reports about those. My goal today was pretty ambitious, considering my training this summer. I've been to higher elevations than this but I haven't gone as far since last year. Arrow marks the trail; I can see it on the other side of the snow near the point. 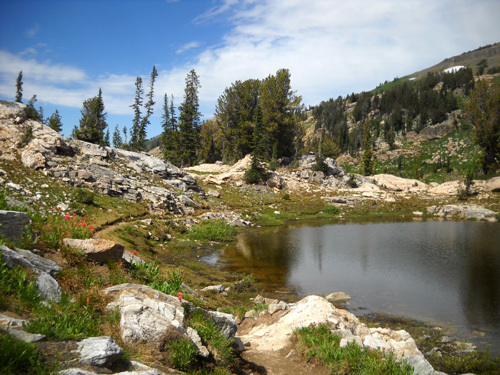 Long story short, it took me 10� hours to hike 21� miles with an elevation gain of over 3,600 feet and the same amount of elevation loss (~6,800 feet at the trailhead to ~10,400 feet in the upper basin, plus lots of ups and downs along the way). The time included plowing through or detouring around lots of snow, trying to find the trail on the other side of several long snow banks, fording streams, stopping for snacks, talking to other people, gawking at interesting scenery, inspecting flowers and other things that caught my eye, and taking a personal record-setting number of pictures. This is one of the most fun hikes I've ever done. Cody seconds that. He did great, considering it's the longest hike he's done in a year, too. I'm just sorry Jim couldn't enjoy it with us. His knee simply won't allow him to do much walking. He compensated by riding his bike a total of 23 miles down in the valley while I was playing in the mountains. 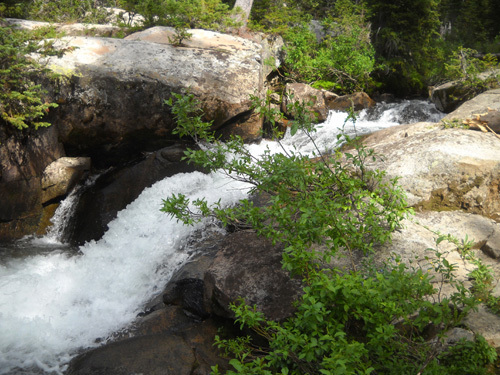 South Teton Creek pours through a rocky chute about five miles above the trailhead. I drove a couple miles from our campground to the very end of Teton Canyon Road (FSR 9) and parked at the trailhead about 7 this morning. The weather was good all day � sunny in the morning, lots of clouds late morning/early afternoon, then more sunny by mid-afternoon. I had just gotten up to the tree line when gray clouds appeared to the southwest but I didn�t see much rain falling from them and I couldn�t hear thunder so I just kept going. That worked out OK � this time! Even with all the clouds it was warm in the basin during the mid-afternoon and rather hot through the lower canyon later in the day. If I'd realized how much water would be available along most of the route today I wouldn't have made Cody wear his pack. 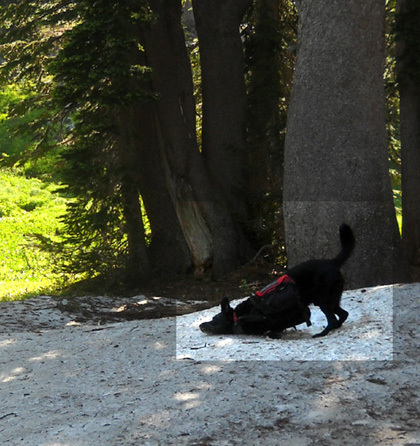 I dumped most of his water out when we were up in the basin. There was convenient water everywhere except a couple miles out and back through the lower canyon. 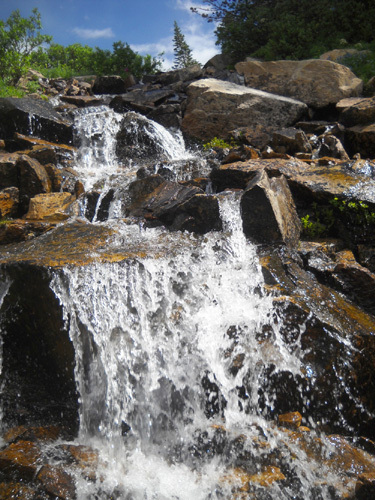 In fact, I saw water today where I�ve never seen water before on these trails. Since the Tetons got more snow than usual last winter, like most of the Rockies, there�s a bunch of it still up there. Every day some more of it melts and either pools in low spots or runs down the slopes. Feeder streams that were dry in 2007, 2009, and 2010 when I�ve been up there were full of water today. 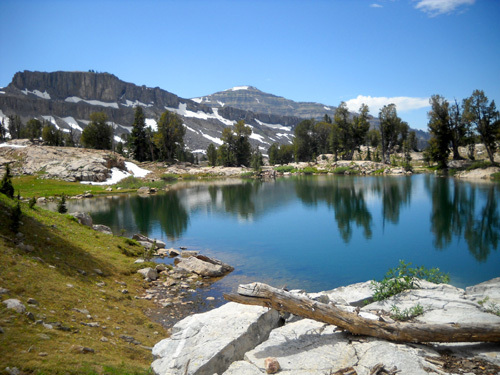 The creeks I�ve forded previously were higher than ever � some knee-deep that I've never seen more than ankle- or calf-deep. And the snow -- wow. 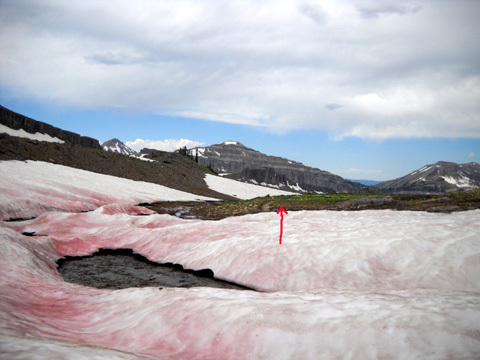 When you see pictures of deep snow in the basin, remember it's late August. 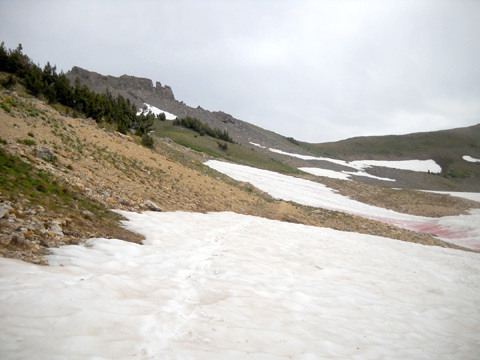 I took plenty of photos of snow where I haven�t seen it before because I may never see that much up there again at the end of summer when we like to visit the area. 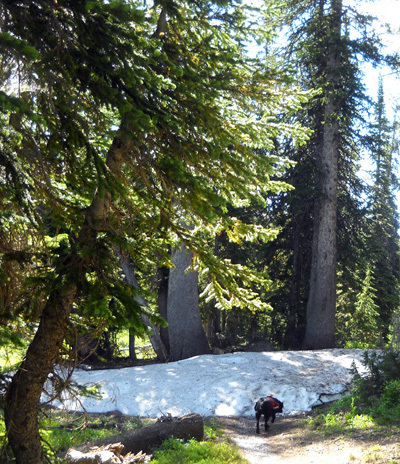 Well below tree line, before the horse camp, I ran into snow on and near the trail in very shady spots That was about 9,600 feet elevation, as I recall. He did that repeatedly. 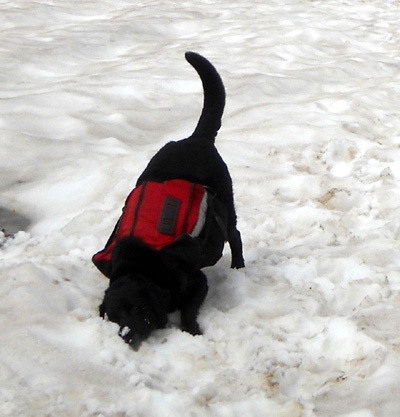 He had more than enough snow to play in when we got up to the upper reaches of Alaska Basin.